Cadence is approx 15 1/2 inches from head to toe. 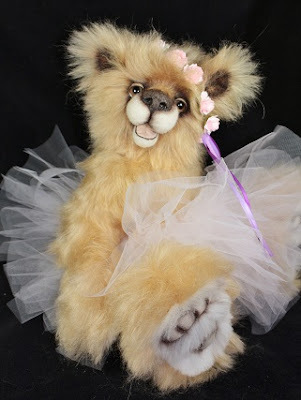 She is made from a long wavy Schulte Mohair in a gorgeous light caramel/blonde in an open mouth design. Cadence has a needle felted face and a felted and sealed nose. Her open mouth is premium ultrasuede. She has English glass eyes complete with lids,whites and eyelashes. Her paws are in a dense white alpaca with trapunto ultrasuede details. Cadence is wearing a handmade ribbon and tulle tutu and a paper flower and ribbon head piece.